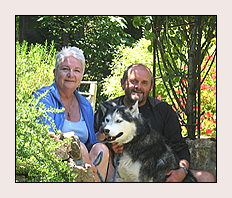 Hi, we're the Georges (Donna, Doug & Sammy) and we want to welcome you to our website, and hope to be able to personally welcome you to our property on the beautiful Big Sur coast at some future date. We live on 19 very secluded acres located 11.2 miles south of the Rio Road intersection in Carmel, California and 15 miles north of the village of Big Sur. We feel so blessed to be able to live in this sacred place that we have constructed two cabins on our property so that we could offer the opportunity for others to share our experience here. We have two one-bedroom cabins nestled in the Big Sur redwood forest, and while the cabins are less than 100 yards apart, they are completely private from each other and from our main residence. They are only about 50 yards from the paved, Monterey County road on which our main residence is located. As you will see from the pictures that follow, luxury-rustic is the theme; with well-equipped kitchen and bath, well stocked linens, towels, cotton bath robes, down comforters on the queen sized beds, and the latest high-tech fireplace heaters that look so much like a wood-burning fireplace that you might think you actually hear the crackle of the firewood! All the guest needs to bring is their food and drink. Baths are located outside on the deck, and the clawfoot bath tubs are included for ultimate relaxing in nature. There are no phones or TV, but wireless internet is included for those who simply can't “be out of touch” for an extended period of time. Massages, if desired, can be scheduled in advance at the cabins with a masseuse or masseur from the Esalen Institute. Most of our guests are busy, career-oriented folks who need a place where they can really “unplug.” The main attraction: intimate contact with Mother Nature. A creek runs on our property just below the cabins and provides the soothing sound of moving water year round. Excellent hiking is available right on our property, and many guests have hiked the half mile creek trail (named Azul Trail). In addition, world-class hiking trails are easily accessible on the eight-mile paved Colorado Canyon Road on which our property is located, and on both directions on Highway One towards Big Sur and Carmel. Beautiful Garrapata beach is about a 15 minute drive from our property. * Many of you who have visited our property in the past are like us, also pet lovers; and may remember our Siberian Husky, Azul (right), who was with us for 15 years. Azul made his transition in April, 2011 in a very peaceful manner. 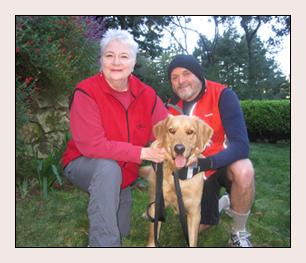 As a tribute to our beloved pet, we have named the hiking trail The Azul Trail. Click here for more information about our beautiful area. Ready to make a reservation, check rates, or inquire about availabilty? Click here.